When you want the beauty and durability of stone for your bathroom and kitchen countertops, or other places in your home, begin your journey at Stone Age Granite’s showroom in Lethbridge. Our showroom is open to the public and features more than 1,000 slabs of granite, marble, quartz and quartzite from around the world. When people see the exquisite quality and depth of selection we have in stock, they tend to say: wow. At our vast showroom, with the help of our knowledgeable, friendly staff, your vision can take shape. Based on the look and function you want, Stone Age Granite can help you choose the material and the individual slab that’s perfect for your home. Based on your choice of material and look, with our advice and expert installation, you’ll have the kitchen and bathroom countertops of your dreams, in no time at all. We’re Stone Age Granite and we’ve been doing wow since 2006. See us first for granite, quartz, marble, quartzite and other types of countertops for your kitchen and bathroom. Stone Age Granite. A proud member of the Stone Fabricators Alliance. With decades of experience, backed up with state-of-the-art computerized cutting and polishing machines, our staff will give you the personal service you deserve. It starts with the first phone call or visit to our showroom, all the way to the final piece of stone installed in your home. No other company can provide the service, quality and value for money that you will find at Stone Age Granite. There’s nothing like the timeless natural beauty of stone to give you the home of your dreams. Most of our work is in granite, quartz, quartzite and marble countertops for kitchens and bathrooms. Even so, the beauty and functionality of these materials will elevate many other parts of your home, from fireplaces to games rooms. Stone Age Granite can help you explore all the ways natural stone can elevate your home and your lifestyle. Bathroom countertops and vanity tops are a specialty at Stone Age Granite. From our vast selection of stone materials, we can help you choose the one with the look and function you want. Trust Stone Age Granite to transform the most important area of your home. We will help you every step of the way to ensure that you and your loved ones and friends will enjoy your kitchen for years to come. Love your Stone Age Countertops? From the very start with Deb’s quote, up to the final polishing of the quartz, the service we received was professional and very satisfactory. When James came to measure and prepare the template, he explained the process to us, and when he came to install the countertops, he was very thorough, advising of how to care for the counters. So glad we chose Stone Age for this service. Would recommend them to others and would certainly go back to them. Excellent service. So happy with the finished product. We came in after our original countertop plans fell through so we were on an incredible time crunch. They were accommodating and were able to have our counters measured and installed within two weeks!! And our kitchen looks amazing. Couldn’t be happier. Highly recommend!!! We recently had Stone Age Granite install Leathered Steel Grey granite in our kitchen. It is beyond beautiful, perfect for our house and the style/look we were going for. Reuben and his team were amazing to deal with throughout the process – thorough, professional, friendly and made us feel valued as homeowners … and, I can tell you that is not the experience that we had experienced elsewhere. I would highly recommend Stone Age Granite to anyone looking for a great experience in finding the perfect granite for their place! Are you considering a home remodel? If so, you might want to consider replacing your kitchen and bathroom countertops. Whether you are replacing or refacing your cabinets, a new countertop can really make a statement. Impress your friends and family with a new kitchen countertop or bathroom countertop. 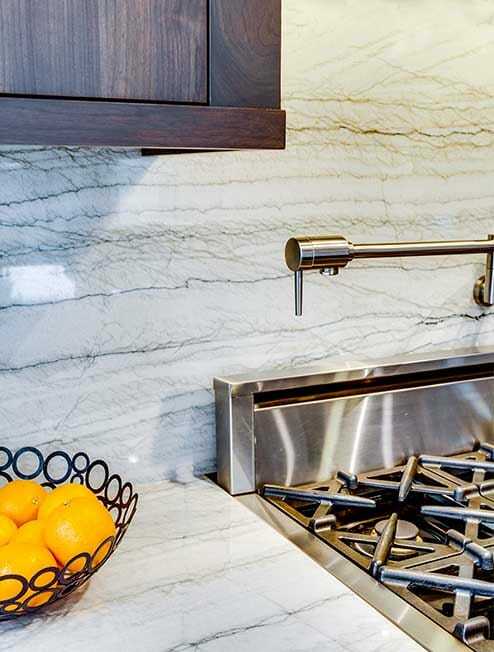 New stone countertops can be more affordable than most people think. Best of all, the experienced professionals at Stone Age Granite can help you decide on the perfect color and style of material to use on our project. We can help you decide between Quartz, Marble, Granite or Quartzite countertops. Each material has it’s own benefits and can help enhance your recently remodelled Kitchen or bathroom. Building a new kitchen or bathroom in a new home? Then you need to talk to the experts at Stone Age Granite. We can work with your contractors to provide you a stunning new kitchen and bathroom countertop designed to match your style but remain functional and easy to maintain. Please click the “request a quote” link above to learn more.